It seems like everyone loves the holidays! They provide such special times for families to get together. They are times for keeping special family traditions going year after year. This is especially true of the period of time surrounding Christmas and New Year’s Day. “It’s the most wonderful time of the year,” the song goes. Then there is Easter, to which many attach a deeply religious meaning. But are its traditions and customs biblical? What do colored eggs and chocolate rabbits have to do with the supposed meaning of the day? Why can’t we find specific instructions about the careful observance of Christmas and Easter in the pages of the Bible? One would think such important celebrations would be a major part of the teaching of the New Testament Church. But the Bible does not teach their observance. The Bible teaches seven meaningful holy days, but not the major holidays celebrated today. Does this surprise you? It shouldn’t. 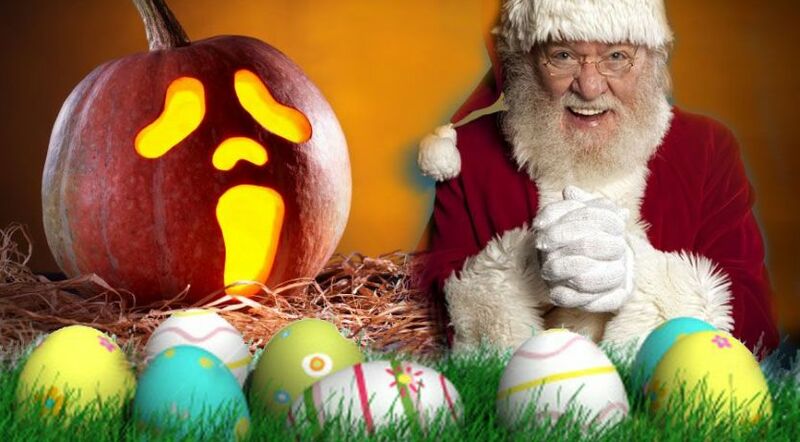 Every year the newspapers and Internet are filled with articles describing the intriguing details of how the customs and traditions surrounding Christmas, Easter, New Year’s, Valentine’s Day and Halloween began in ancient pagan rituals. A search of several older reference works will show these facts have been known for many years! Notice that? These recognized historical authorities show Christmas was not observed by Christians for the first 200 or 300 years after the life, ministry and death of Christ—a period of many generations after the establishment of the Church on the Day of Pentecost. Clearly we see there is no biblical justification for the observance of Christmas. So where did Christmas come from? William Walsh provides some of the historical origins of Christmas in his book The Story of Santa Klaus: “We remember that the Christmas festival … is a gradual evolution from times that long antedated the Christian period. ... It was overlaid upon heathen festivals, and many of its observances are only adaptations of pagan [ceremonies]” (1970, p. 58). Reporter Jeffery Sheler noted, “So tarnished, in fact, was its reputation in colonial America that celebrating Christmas was banned in Puritan New England, where the noted minister Cotton Mather described yuletide merry-making as ‘an affront unto the grace of God’” (“In Search of Christmas,” U.S. News and World Report, Dec. 23, 1996, p. 56). Imagine that! Early New England settlers actually banned the celebration of Christmas! The Puritans fined anyone who celebrated Christmas. Spending just a brief amount of time in research, one can quickly see that practically every tradition associated with Christmas originated in pre-Christian pagan ritual practices. But what about Easter? Isn’t it biblically based, depicting the resurrection of Jesus Christ? Again, we find the same result. If you research Easter customs, you will find that many of them are based on ancient fertility symbols. Have you ever stopped to question why bunnies and colorful eggs are so closely linked to the commemoration of the death and resurrection of the Savior of mankind? Perhaps it’s time we did just that—ask questions. What we see is a combination of biblical themes with the pagan traditions of ages past. This is called syncretism. Notice this definition of syncretize: “To attempt to unite and harmonize especially without critical examination or logical unity” (Merriam-Webster’s Collegiate Dictionary, 11th edition). Many people will acknowledge that this practice of syncretism played a part in the expansion of Christianity through making it more appealing to pagans. Some think, so what if some of our customs and traditions surrounding cherished holidays have pagan or non-Christian origins? Why does that really matter if one’s intention is to worship God through these various customs? Many would claim that these “quaint” customs only enhance the celebration and make it fun for the family. Let’s look at that carefully because a great deal rides on how that question is answered. Holy days vs. holidays: What does the Bible say? Christianity is based on the Bible. What does the Bible say about holidays and customs? God warned His people not to seek to learn how other nations worshipped their pagan gods: “You shall not worship the LORD your God in that way; for every abomination to the LORD which He hates they have done to their gods” (Deuteronomy 12:31). This description of an ancient pagan worship of idols, with parallels to the modern Christmas tree custom, helps establish a critical premise from Scripture: God’s people are not to learn the ways of people who do not worship Him. Is it possible that our cultures, intending to honor Christ by celebrating the supposed dates of His birth and resurrection, are doing it all in vain? The Bible enlightens us with God’s instruction to avoid the traditions and customs that are rooted in non-Christian cultures. Does this mean all religious holidays and festivals are offensive to God? By no means! We find repeated commands to keep the Sabbath and the holy days as outlined in Leviticus 23. These observances are proclaimed as “the feasts of the LORD” to be proclaimed throughout all generations. John 7 describes Jesus Christ teaching at the observance of the Feast of Tabernacles. Luke 22 shows that Christ and His disciples kept the Passover and the Days of Unleavened Bread. If the Bible is our guide to the observance of religious holidays, the conclusion becomes clear. But what will be our guide for living? God’s words or our own logic? Jesus’ own words are direct: “‘For laying aside the commandment of God, you hold the tradition of men. …’ He said to them, ‘All too well you reject the commandment of God, that you may keep your tradition’” (Mark 7:8-9). Paul chimes in with his letter to Colossae: “Beware lest anyone cheat you through philosophy and empty deceit, according to the tradition of men, according to the basic principles of the world, and not according to Christ” (Colossians 2:8). What else can we say? What decision do we make? This is not necessarily true of nonreligious holidays frequently observed in nations around the world. Observances similar to the American holidays of Memorial Day, Fourth of July and Labor Day are not intended to be religious holidays and can be acceptable to celebrate. Also, the Jewish holidays of Purim and Hanukkah were established to give thanks to God, just as the American and Canadian Thanksgiving days are. Though some modern customs of these days may not be pleasing to God, they are not rooted in paganism and do not subvert any of the truths presented in the festivals of God. What will a true disciple of Christ do? Holy days vs. holidays? Does it really matter what religious days we celebrate? Why not look into it and prove it for yourself? Maybe you will be shocked by what the Bible actually teaches!